When I first came across the word "Benelux" while surfing online for other inquiries, I was perked up immediately. That "-lux" at the end of the word stands for Luxembourg, a country so small it could be argued they do not even have their own cuisine, and certainly it's never seen in New York City. As for the Netherlands, it is grossly underrepresented as well (many might laugh and ask if they have a cuisine either and make jokes about potatoes). Belgium is the only nation of the three that actually has a substantial footprint here, with beers, mussels and beyond. Benelux is a term used first near the end of World War II for the three nations that formed a political and economic union. Now that we have the European Union, the term is basically only used when talking about geography. 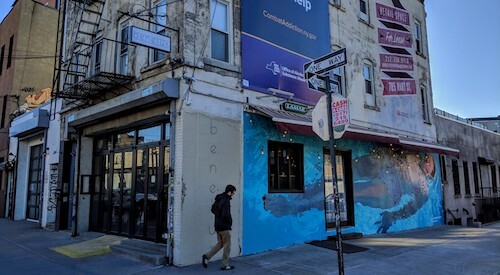 This hip place definitely has the atmosphere of Bushwick rather than Western Europe, but nonetheless the menu has some excitement on it and a few unique items. A quick sidenote, in case you were wondering, the place on East 70th called Cafe Luxembourg is a French-American bistro and has absolutely nothing to do with the country of Luxembourg. This tiny nation does have its own cuisine, which takes many of its cues from France but a few from neighboring Germany as well. 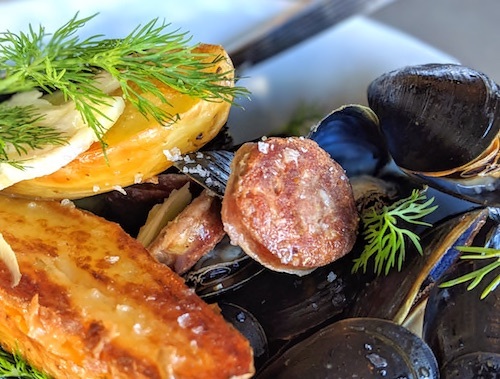 This manifests itself in the mussels Luxembourg ($19, above and below), cooked in a Belgian-style white broth but supplemented with potatoes and sausage, as well as fennel and dill. The combination is executed very well. 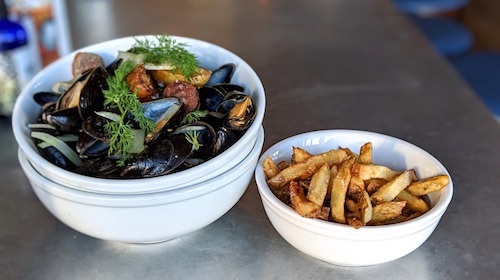 Dishes of mussels are all served necessarily with above average fries, although I did have to ask for mayonnaise, which surprisingly required a trip back to the kitchen. A bottle of Heinz shows up a few seconds after the order is placed. While I like a good ketchup-mayo mixture, somehow I feel like a European would be appalled by this sequence of events. They have three options for mussels, one from each country. The Belgian version is cooked with beer, endive, and smoked butter, while the Dutch version prefers white wine, celery, and lemon. My knowledge of Belgian New York City is by no means exhaustive, but this was the first mitraillette ($16, below) I have ever come across. 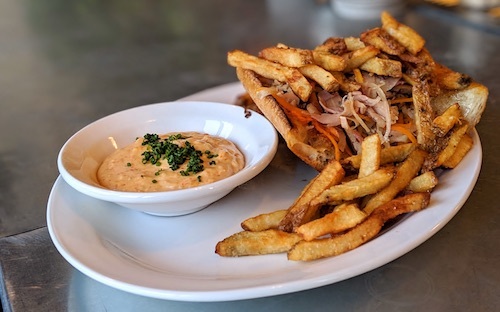 This Belgian classic is a sandwich practically screaming to be eaten late into a night of drinking, a baguette piled high with greasy meats, pickles and fries. While the meat options can be different when eaten at friteries, they use a simple but delicious roasted ham here. A spicy mornay is served on the side, a type of béchamel that reads more like an aioli but which seems like a match made in heaven with the other ingredients. Recommended. You could spend a lot of time at the relaxed bar here, enjoying East Coast craft beers as well as stronger Belgian varieties. As far as I could tell there were no Dutch or Luxembourgish options, but that is probably ok.